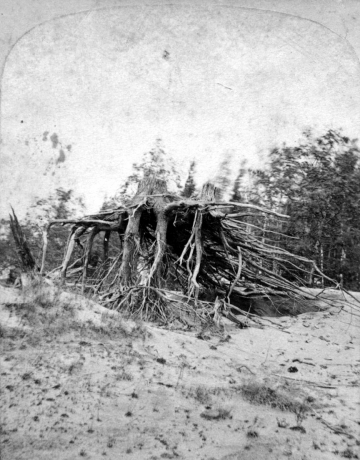 The historic image shows a tree stump with the roots exposed. The wind has blown the sand away from roots. There are some small grasses growing in the sand around the stump. Trees are visible in the background of the photograph. An inscription on the back of the image reads, "Pine stump near Georgia Station." The photograph is from a stereoview.